Fresh Meat Productions is proud to co-present this Frameline screening of Songs For Alexis. 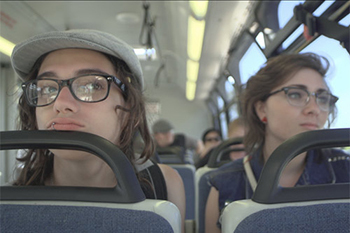 When director Elvira Lind introduces us to Ryan Cassata, he is comfortably displaying scars on his bare chest. A transgender 18-year-old living in the suburbs of Long Island with his highly supportive single mother and two brothers, Ryan has known—and owned—his sexual identity since he was twelve. Ryan is also an aspiring singer-songwriter and an incorrigible romantic. The beneficiary of his love—and of his many love songs—is 16-year-old Alexis, a girl from California he met at a summer camp in San Francisco. Despite the distance between their homes, the young lovers sustain a deep connection and a passionate relationship both in person and online. When their love affair is threatened by Alexis’s father’s hostile disapproval of Ryan and the potential legal ramifications of their age difference, difficult choices will need to be made. This endearing coming-of-age documentary is told in an unobtrusive but remarkably intimate manner by a filmmaker whose presence is never felt but whose skillfulness is evident in every frame. The result is a touching love story told as the subjects have chosen to tell it—much as they ultimately choose how to live their lives and with whom.